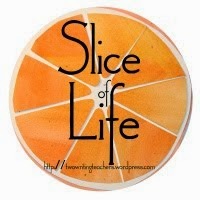 I'm slicing with the Two Writing Teachers community for Day Eighteen of Thirty-One of the Slice of Life Challenge in March. Thank you Stacey, Tara, Anna, Betsy, Dana, Kathleen, Beth, and Deb. And It's Poetry Friday. 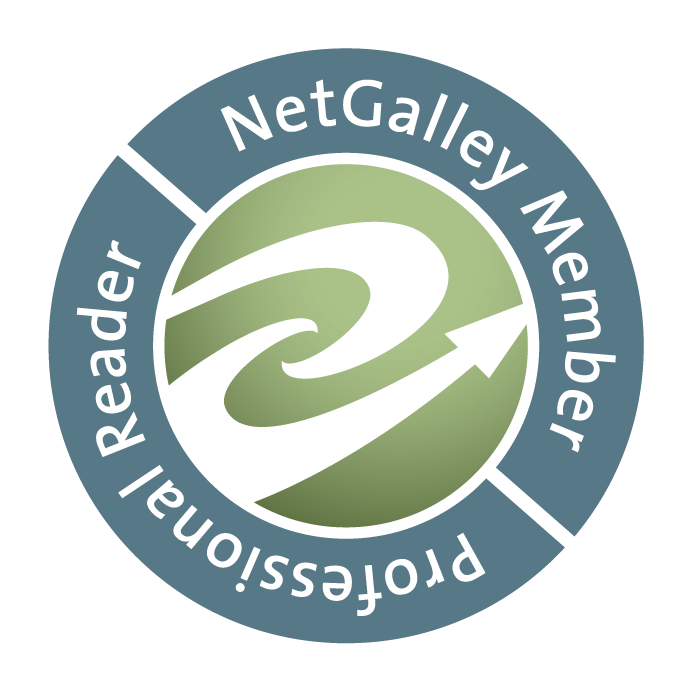 Find everyone today at Robyn Hood Black's blog, Life On The Deckle Edge. Robyn's sharing more lovely student haiku today, and a tip from one of her daughter's students. Thanks for all, Robyn. Yes, spring really is around the corner, but in Denver, at this time of year, that means snow along with blooms. We've had an unusually dry March, and this moisture is desperately needed. Nevertheless, I can't help but be sad seeing the daffodils and forsythia and a few fruit tree blooms that don't welcome the snow. I am grateful for some sights, though. 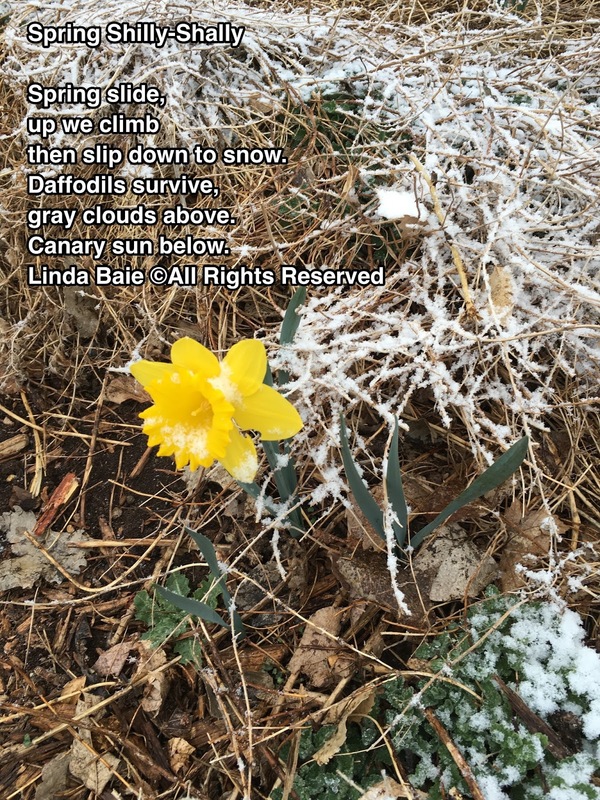 Love your poem title, Linda - and the way you've captured the capriciousness of weather in this transition of seasons! Wishing you warmth and flowers, and some spring rain for them. Thanks, Robyn, about six inches of snow today, and hope it's the last, but always hoping for spring rain! Oh I love that "daffodils survive" and "canary sun below"! Iam in the northeast where the crocus are up showing their pretty colors, iris and lillies are poking their green leaves out from the earth. We are expecting a northeaster this weekend. Oh my! It must be this storm traveling your way. Good luck! Great slice! I'm anxious for spring to arrive and stay, just like the daffodils. Our daffodils are up as well as other spring flowers. They are calling for snow on the first day of Spring. Go figure. I guess it's this storm traveling east. Hope you don't get too much. Shilly-Shally--What a wonderful word! I love the "canary sun below" and the way you've used the slide imagery to capture the ups and downs of spring. Last weekend in Maine the mercury topped 60 degrees but we're anticipating a potentially heavy snowfall this Monday. Slide! Great poem! Thanks Molly, hopefully it's the final goodbye of winter. I love this--the energy and the images. That's exactly how it's been around here. I tried to capture the same thing on my blog with my two haiku. Thank you Liz, I imagine we're all thinking the same thing with this spring's weather. Shilly-Shally! Yes! As you know, this is how we feel about spring in the Midwest. Cautiously waiting, knowing that snow could pelt us again at anytime. Beautiful imagery. Thanks! You're welcome, Kendra, it truly is an up and down time. I remember seeing daffodils peek their heads out of snow as a child. Such a fun image! And your "canary sun below" is delightful. I also love the words shilly shally. It seems like they need their cousins to come along and dilly dally! Thanks, Ramona, I'm afraid to look now how that daffodil is faring. We have about six inches of snow & still snowing. But as I keep saying, we need it! Yikes, six inches of snow?! That's more than we've had all winter. Our water count is down too, so I'm grateful for rain, but the snow can stay away. However, we too, are supposed to slip into freezing temps. You will hear me wailing as my peach blossoms freeze. I know, it just doesn't come at the right time. I hope your freezing doesn't do too much damage, Elsie. The perfect poem for this tryin to be spring you are experiencing! Thanks Carrie, always interesting in Colorado! Thanks, Linda - that is such a sweet poem. Here in Seattle, the March story has been all about WIND - hurricane force, bringing down many trees, young and old. But I hear the Skagit Valley fields just north of us are alive with brave daffodils and tulips. Spring really is unpredictable, isn't it? Yes, it certainly is. I am grateful for the moisture, but don't like the snow sitting on my lilac buds! Thanks, Julie. We had another snowfall today. Friends around the world post pictures of bud, leaves, blossoms. Nothing here, yet. I long for spring. Looking at the bright side - at least it is getting lighter and lighter every day. Your poems and pic of daffodil give me hope. There is quite a lot blooming, but not as much as other, warmer places, Terje. I just hope it's the last snowfall, & then only rain. Yet we never know. Glad to offer hope to you! "shilly-shally"...been so long since I heard that word-song that I had completely forgotten about it. Thanks for the nostalgic reminder and the promise of more canary suns rising. Here's to Spring's Sunday arrival amid promises of weekend snow showers, starting tomorrow. Go figure! God bless you. Thanks, CB. I know the storm is headed out to the east. Hope it's the last hurrah for winter! Here's to the daffodils - may they survive! I've seen a few peeking up here and there, too, Linda - welcome sights! Glad they're there for your delight, too! Love this poem, Linda, and especially that "canary sun." What a wonderful way to celebrate its resilience. Thanks, Michelle, it was fun to write. This is welcome, but I just wish it was rain this time. The mountains are getting a lot, which is wonderful for the skiing. I hope it's the last, but we can get it later, too. We'll just have to wait and see. No plants like that outside here, Tabatha. We have to wait quite a while. Phew! Quite the storm this morning. I'm about to walk the dog, I wonder how many daffodils will still be standing! I don't know, but much has melted. I'm hoping about the buds even more. We have a similar forecast here in CT, but I'm sure it will melt quickly and those "canary suns" will shine again. Lovely poem, Linda! Thanks, Catherine, heading your way! Love the canary sun below...such a nice time of year to see live springing forth. And yet here, we have a potential major snowstorm on the way for Monday! I think it's a storm that evidently is going to come your way, then gather moisture from your coast, Matt. Thanks. Today a lot melted on the plants, which is good. 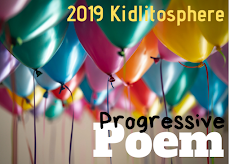 That picture is so neat, Linda, and it makes the perfect backdrop for your poem! 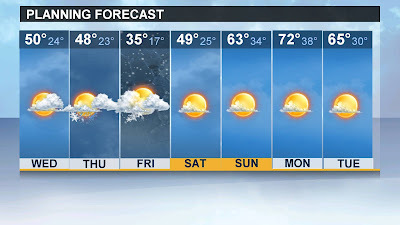 We are in this weird mixed-up weather in Ohio too -- gorgeous most of this week, and now maybe sleet & snow this weekend! Yep, we just got it first, Jennifer. Thanks. I know, you've described it well, Violet. And we can have snow even in May, never know when, or if? Thank you. Oh omg goodness, that picture is amazing! You must put that in some sort of frame or display it with your words somewhere! :) In Wisconsin it's hit or miss this time of year now. We had sun and 60's last week and then snow in the forecast for Monday! Ah, nearly everyone unless they're south, are going to get part of this storm I guess. Hope it's not too bad for you, Ana. The Colorado cold has made it to Ohio, although it looks like we'll be just north of the snow. My hyacinths are hugging themselves, waiting for the sun to return! It's cold today too, but warmth is on its way, I guess to you too in a few days. I bet those hyacinths are hugging themselves! Indeed, Brenda. Each morning is a surprise, which makes it eventful I guess. I hope you don't mind me linking to your delightful poem in honor of World Poetry Day. What a nice compliment. Of course you can, and thank you, Brenda. We don't get snow, but the clouds are looming, the breeze cool. Where did spring go? Love the image and the shilly-shally. Thanks Margaret. Now sunny today & lots warmer tomorrow. Changing spring! You're welcome, Bridget. I agree that changes happen everywhere, not just in precipitation and temperature. Enjoy your lovely Tucson spring!